ADATA has released three new SSD lineups: XPG SX900, Premier Pro SP900, and Premier SP800. XPG is ADATA's high-end brand aimed at gamers and enthusiasts and SX900 is the first SSD entry to XPG family. ADATA also uses the Premier brand in their other products and it's mainly used with middle-class products. SX900 and SP900 are both fairly normal SF-2281 based drives. 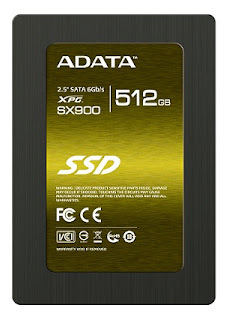 ADATA's product positioning is very similar to OCZ's: SX900 is equivalent to Vertex 3 and SP900 is ADATA's Agility 3. SX900 comes with synchronous NAND (see Anand's explanation), which provides increased random read and write performance (see our Vertex 3 and Agility 3 comparison in SSD Bench). We are looking at 550MB/s read and 520-530MB/s write, which is typical for SF-2281 based SSDs. SP800 is ADATA's budget drive: It offers small capacities and SF-2141, which is SandForce's second generation SATA 3Gb/s controller. It offers higher random I/O performance but has only four channels, which makes it ideal for small capacity SSDs. The interesting thing about ADATA's new SSDs is the fact that they offer ~7% more capacity than other SandForce based SSDs. Generally, SandForce based SSDs use ~7% of the NAND for over-provisioning and usually manufacturers don't mention that NAND in the total capacity. This means your 120GB SandForce drive actually has 128GB of NAND in it. However, SandForce has recently released a new firmware that allows manufacturers to modify the over-provisioning percentage and ADATA is taking advantage of that. The new firmware allows over-provisioning of as low as 0%, which means a 128GB SandForce drive finally has 128GB of usable capacity (before formatting, of course). 0% over-provisioning introduces some potential problems, though. SandForce drives have no DRAM cache so the over-provisioned NAND has worked as a cache. Without any over-provisioning, performance may take a hit because wear leveling and garbage collection may not work optimally. Fortunately, there is still some extra capacity left thanks to translation between gigabytes and gibibytes. (The SSD Review has a more detailed explanation on this). Unfortunately, ADATA has not revealed pricing so comparing their offerings with other products is hard. In the end, SandForce SSDs are all very similar in features and performance, hence price is a crucial factor. ADATA may not be the most well-known SSD brand, but they've been around as a memory manufacturer for a very long time and they've been gaining momentum lately in the SSD world. For example, NewEgg is selling ADATA SSDs and the reviews are there are fine (yes, I know—take Newegg reviews with a generous helping of salt! ), although the drives are nowhere as popular as e.g. OCZ and Crucial drives are.